Over the past few years I’ve developed an obsession with what different cultures do with cheap cuts of meat. The stewing, the braising and simple slow-cooking of often tough, sinewy or bony meats that people originally ate out of financial necessity is fascinating. This Rabo de Toro Oxtail Stew recipe from Jerez in Spain is one dish that really fits the bill. It’s interesting how many slow cooked dishes have risen above their station and become regional specialties. Bœuf bourguignon from Burgundy in France, osso bucco from northern Italy, tagine from Morocco, and beef rendang from Indonesia are all examples of dishes that began quite humbly and developed into taste sensations. These are also dishes that generally taste better coming out of the kitchen of a skilled and experienced home cook than they do from a chef in a restaurant! So what do these hearty dishes have in common besides big, earthy flavours? Mainly their slow cooking — and by this we mean many hours of slow cooking — and often an overnight stay in the fridge to let the flavours come together. 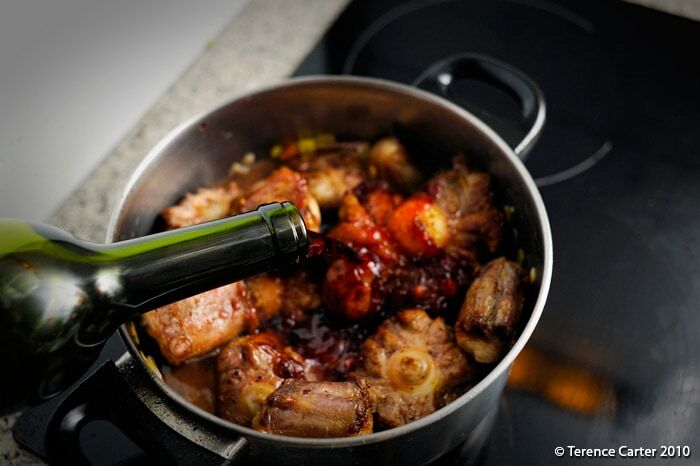 Recipe — The Dish: Rabo de Toro or Oxtail Stew, Jerez, Spain. 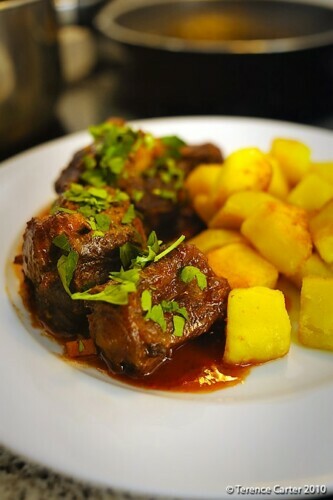 Recipe — The Dish: Rabo de Toro or Oxtail Stew, Jerez, Spain. Copyright 2014 Terence Carter / Grantourismo. All Rights Reserved. 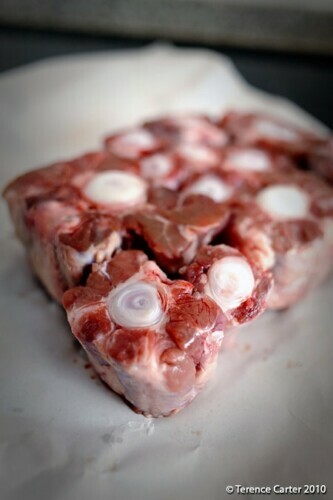 Oxtail pieces straight from our favourite butcher in the Jerez markets. 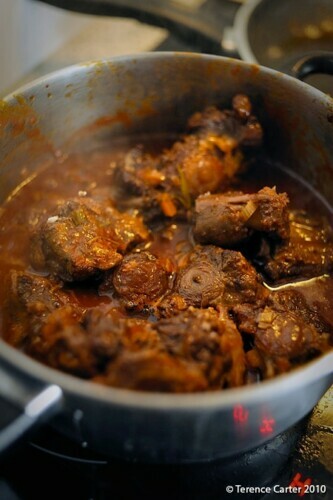 Oxtail Stew (Rabo de Toro) recipe. The Oxtail after the initial browning. Vegetables sweated down, ready for the oxtail. Adding the wine. Don't be shy, upend it. The stew almost ready for serving. Now's when you finish those potatoes. The final dish, yes, it was delish! Just as with the Moroccan tagine I made in Essaouira, these are not dishes you start thinking about making at 6.30pm and expect to serve the same night. If you attempt one of these at 6.30pm, you had better have the number of a pizza place on speed dial. However, while these are dishes that do take time, they don’t necessarily require effort, or the expertise of a Michelin-starred chef. After ten days of eating out in Jerez, and savouring an especially tasty rabo de toro or oxtail stew at Bar Juanito here, I decided that was going to be the quintessential dish of Jerez that I was going to learn to make. Most people will know that a toro is a bull, and, well, an ox is a bull with its privileges removed, so to speak. Here in Jerez oxtail stew is a very common dish and oxtail is readily available in every butcher shop, as are many other cheap cuts of meat. 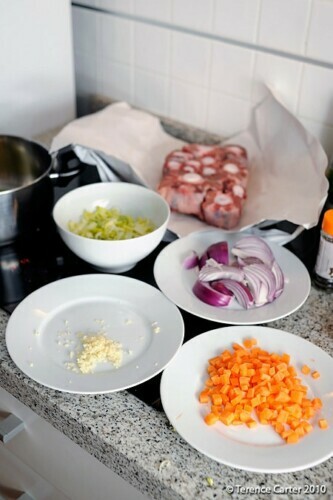 For this oxtail stew recipe, with generous portions for two, the oxtail cost €10 for a whole tail cut into portions. After researching countless regional oxtail stew recipes and talking to locals, I came to the conclusion that it closely resembles bœuf bourguignon, only it’s tastier because the marrow from the ox tail adds depth to the gravy or sauce. The bone and the marrow aren’t used in bœuf bourguignon. 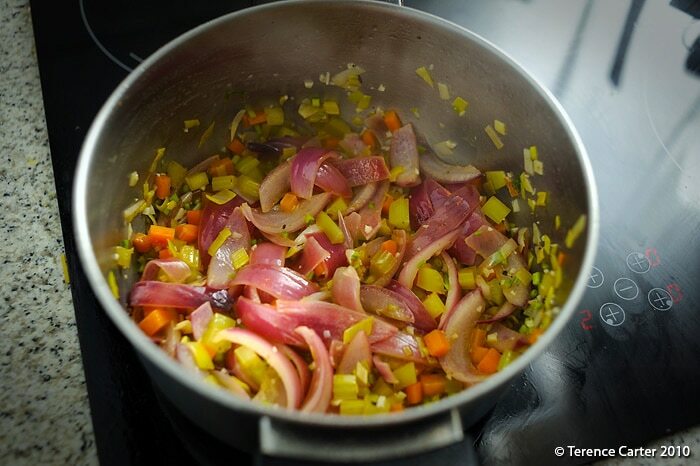 Both dishes require the meat to be browned, a mirepoix (a mix of diced onions, celery and carrots) to be sautéed, and the two to be combined. Then wine and tomato paste are to be added. Other ingredients are optional. Interestingly, bœuf bourguignon generally has a mirepoix au gras — mirepoix with ham or bacon, as well as leeks, parsnips, garlic, or shallots. To me these are also fine additions to rabo de toro too. In many an oxtail stew recipe I found Spanish chorizo (spicy sausage) was added to the rabo de toro, but in my opinion, if you’re doing it right, the dish needs no such unnecessary complication of flavours. A dash of sherry, or two — one for the pot and one for the chef! Heat oil in a large saucepan over med-high heat. When hot add the oxtail and brown the pieces all over. Add some salt and pepper while it’s cooking, not before. Remove the oxtail and add the onion, celery, and carrots — and leeks, if you’ve taken my advice. Add a dash of sherry and scrape the browned bits of meat off the bottom of the pan as the sherry evaporates. If you don’t have browned bits, you’ve not cooked the oxtail at a high enough heat. After the mix starts to colour, add the garlic, parsley stems, the peppercorns, the sweet paprika and hot paprika or dried red chilli flakes, and then, after a couple of minutes, the oxtail. Add the Rioja. Yes, that means the whole bottle. Drink the sherry if you want a tipple. At this stage you’ll probably need to add water to cover all of the oxtail — this is important so that the oxtail cooks properly. Bring to a decent simmer and reduce the heat to low. You now need to leave the oxtail for at least a couple of hours, but check every now and then that the water is still covering the meat. At two hours the meat should be cooked to the stage where it falls off the bone when provoked. If not, leave it on low heat until it does. 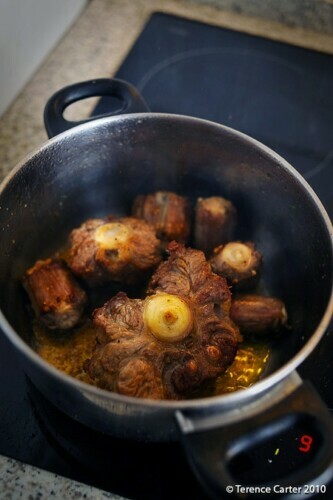 When it’s ready, remove the oxtail pieces from the sauce and place them in a well-sealed container ready for the fridge. Strain the sauce through a sieve (it doesn’t have to be too fine) and pour it over the meat. When it’s cooled, refrigerate overnight. 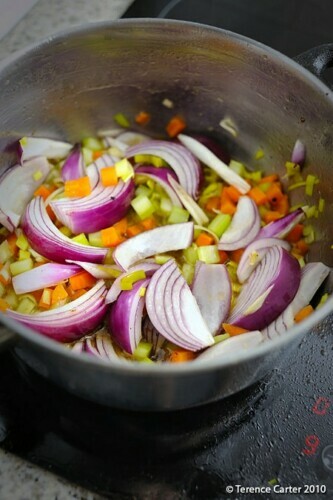 On day two, heat the olive oil over a medium heat in a large saucepan and add the onion and carrot, cooking until they have colour. Add the oxtail and some of the sauce. Cook until the meat is warmed through and then add the tomato paste and some more of the sauce. Check the sauce for seasoning; you may need to add some salt at this stage. Cook this for 15 minutes or so, adding some more of the sauce as you go. If you don’t have enough sauce for a nice pool around the oxtail when you serve, you may regret it — it should be delicious! Check the seasoning again before serving with the fried potatoes. If you liked this, see my other posts in The Dish series in which I search for and learn to make quintessential regional dishes, including a chocolate snack with a Michelin-starred chef in Barcelona, Lamb Tajine in Morocco, and Cassoulet in Ceret. 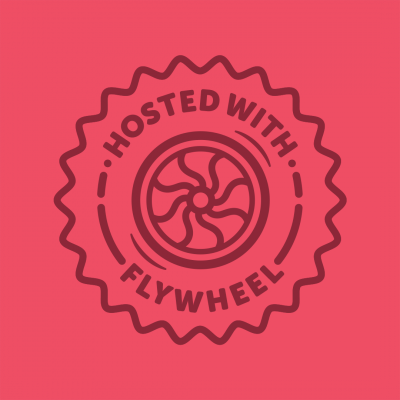 Whew…I’m all caught up, and cannot wait to experience the rest of your journeys along with you this year. Your Oxtail Soup sounds delicious, and how wonderful that you actually have the time and ability to make it while traveling. I discovered ox tail when I was a starving college student. I bought it initially because it was cheap, but discovered it was very tasty, much better than an expensive cut of meat. The meat is delicious, but it also makes a great broth. I haven’t made it in a long time. I miss the amazing aroma of ox tail simmering. I love oxtail. 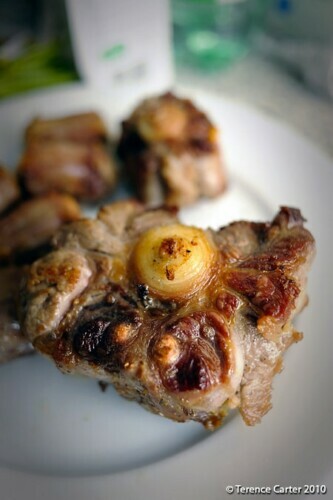 In the Philippines (a Spanish colony for more than 300 years), we have an oxtail dish that is partly influenced by the Spanish, and partly by Malays. It’s called Kare-Kare (rough translation: Curry-Curry)…the sauce is made with ground peanuts (peanut butter), coloured by achiote (annatto), flavoured with a bit of fried fermented anchovy (local term: bagoong). And the oxtail, boiled / stewed until it falls off the bone! YUM!!! Thanks for sharing this recipe!! Will definitely try this one! Jen, I knew you’d have a recipe! I tried Kare-Kare in Malaysia – guess I should have added that one to the list. Even since I’ve posted I’ve had locals telling me that sometimes they do eat it the same night and some *insist* on using Oloroso sherry and not a red wine. Love it that everyone is so passionate about it here! Kangayayaroo, sorry, I missed your comment – maybe with the Philippine connection in Dubai you might be able to find some? It would make a great broth for sure because of the bones – delicious. Thanks for your comment! i wish someone would hurry up and invent smell-o-vision! I have one bottle of rioja to my name and just enough sherry to do this. SO…next week I am going to go and get some oxtail and re-enact this dish. Watch out for the show and tell! It looks delicious and I’ll try not to eat it all at on the first night! By the way – how many people does the recipe above serve? We are 4 greedies in this house! @ Kangayayaroo I have seen oxtail at Union Co-op. Hi Theresa, sorry about the missing number of peeps. It makes a big main course for 2 people. Several people told me that 1.5kg can serve four and you can leave all the other amounts of ingredients the same. I did have leftover sauce. Note that eating out in Jerez they would probably give you 1.5kg’s worth on a plate if you ordered it as a main course! At many places this wasn’t on the menu as a tapas-sized dish. Looking forward to hearing about it! Trust me, it *was* delish! I’m just discovering these comments I didn’t acknowledge – apologies! – we were frantic at the time. I hope you tried making this recipe? Would love to hear your verdict. I had the dish a couple of years ago in Spain and forgot about it till I saw your recipe – looks great. As far as i remember the local guy I talked to back then told me that you would use a full bottle of Sherry – not red wine. When googling I now see different recipes with either or… do you have any experience with that? Whats the reason you chose wine and not sherry? Thanks for your comment. A full bottle of Oloroso sherry was a little to much for me – a little too sweet and a little too intense. I know I mentioned it in the comments, but I will leave a note that many locals suggest this. I still prefer it with a decent, medium-bodied Spanish red. And it’s still a favourite slow-cooked dish of mine! Just made this for the first time. Wow, what a great winter dish. Well worth the time and effort! Excellent Peter! It is worth the effort. Thanks for your comment. While cooking oxtails can be time consuming, it is so worth the time! I love the extra depth the marrow adds to the dish. However, I have not let them sit overnight in the fridge before, so that is something I will need to try. Oxtails braised in red wine is a favorite comfort food of mine – I”ll definitely have to give this recipe a go! I really enjoyed taking the time on a rainy Sunday to prepare and finally savour this delectable stew. Great way to spend day inside in the rain! So pleased you enjoyed it! I couldn’t find Rioja the first time I made it, used a Cabernet Sauvignon. Big mistake, turned out horrible had to fix it tinned tomatoes and stock. I didn’t give up and finally found a bottle of Rioja and what a difference! Found out the hard way that you can’t substitute the wine. Thanks Jolanda. It’s a great dish. Hope you bought a second bottle of Rioja to drink with the dish!